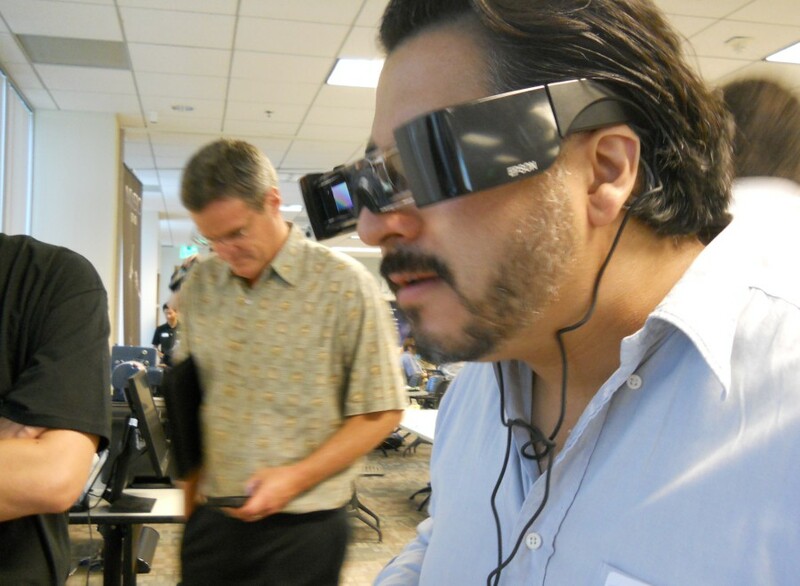 Over 40 local developers were invited to Long Beach this weekend for an insider look at the Moverio BT-100, augmented-reality smartglasses created at Epson America Inc.’s airport-adjacent headquarters. For two days, Epson hosted its first-ever hackathon, meaning small teams were encouraged to intimately explore the Google Glass-like technology and create innovative and useful applications for the hopes of winning a grand prize of $1000. Eric Mizufuka, product manager of Epson’s New Venture group, creators of the Moverio, was enthusiastic about the collaborative development of the BT-100, which launched for distribution in 2012. “The cool thing for the local tech community that they can be on the bleeding edge of these new businesses,” Mizufuka said. Local meet-up group Long Beach Tech and other Android developers were among the Southern California-based teams working hands-on for the two-day competition, hacking the BT-100 and applying their demos. Although the Moverio is available for purchase, it still remains in a conceptual stage, open to alterations according to specific demands, such as durability for on-site construction. Motion Redux Software Engineer Sal Raimi envisions a medical application for the BT-100. He hopes to create a variation on his previous Doctor 3D Smartphone app called ARMED, in which 3D representation of organ system may lay before the viewer. “I’m trying to minimize mistakes; make things easier for doctors,” Raimi said. Unlike most available augmented-reality smartphone apps which overlay augmented reality through image recognition and QR codes, or Google Glass which provides a small window in the corners of one’s vision, the BT-100 utilizes hands-off 3D tracking. One of the applications Epson and partner company Metaio showcased over the weekend were self-guided training simulations ideal for engineering and maintenance. The dark, thick-rimmed smartglasses project a light menu screen at the center of the viewer’s vision. To begin the sample Hackathon exercise, a quick glance at a photo of the moon’s surface placed before a blue pump registers the activity. It is a small quality-assurance process that will be streamlined with the help of local developers, said Mizufuka. Color 3D overlays then emerge, highlighting a step-by-step the assembly and disassembly of the pump. The overlays remain on target as one may begin moving around, unplugging hoses and screwing bolts. “It’s just one of those things you have to see your yourself,” said video blogger Patricia Tsoiasue, fascinated by the 3D overlay app. Her brother was among the Long Beach Android developers collaborating at the Moverio hackathon. Trak Lord, marketing and media relations manager for Metaio, believes that by 2014 augmented reality will become standard on every smartphone and that by 2019, smart phones may be obsolete. According to Lord, Ikea’s augmented reality enable application, in which users can view 3D renderings of catalogued products, was the most the most downloaded brand app of 2012. “There’s always the chance that we could be the next Nintendo Virtual Boy [a 1995 financial failure], but the interest is there,” Lord said. 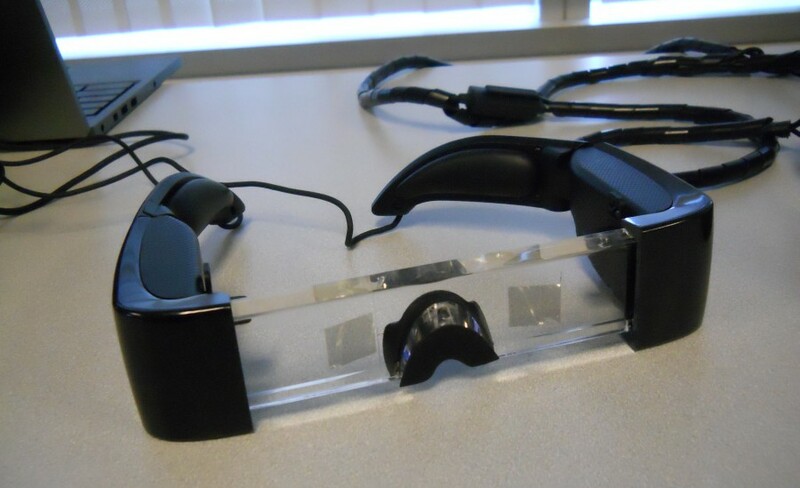 The Moverio Hackathon also showcased the augment reality videogame Oculus Rift, which utilizes smartglasses technology. The player wears a large headset, granting an immersive view and control of the game. A swivel of the head aim’s the first-person view as the player walks through clean hallways shooting lines of red blocks. “It’s like you’re stuck in a game,” said 10-year-old Shay Mishra.